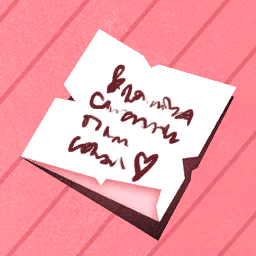 Description: It's addressed to another dancer and signed by someone named #LAST_FOLLOWER#. The writer describes how they met the dancer in a dream, in a dark wood. Their dream featured drum-beats, wing-beats, the skin of shadows, the blood of the moon. No wonder the poem was discarded. But already I can see that there are layers of meaning to unpeel. Description: The heart's throb, or the violin's cry?